If you’re like me, you likely only knew about the world cup when you noticed too many unfamiliar flags waving about in your country. If you’re worse than me, you are probably still asking what sport we’re referring to and if you’re somewhere between “what is a world cup?” and “ughhh world cup again” rest assured you are not alone. 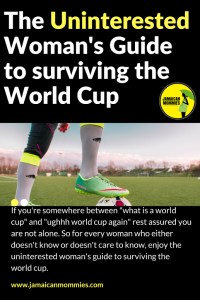 So for every woman who either doesn’t know or doesn’t care to know, enjoy the uninterested woman’s guide to surviving the world cup. Frankly one report notes that more women are watching the world Cup to the point that it annoys their spouse, so beware, you may or may not be alone in your immediate “uninterested zone”. It’s somewhat hilarious, somewhat disheartening as my die hard footballzilla female colleague calls me everyday complaining “Ugghhhhh I want to dicuss the matches with you BUT YOU don’t watch the games”! Acknowledging that some females actually LOVE the world cup and embracing this difference takes every uninterested woman one step closer to surviving the world cup. Step 2: It’s just weeks! Come on, sucker it up, I know looking at the calendar it seems like forever!But what about that pile of laundry that has run beyond the 4 week course, suddenly, the time seems “too short” right? Here’s a good start, think of all the things you’ve been meaning to do and get going on them. For me, it’s finishing quite a few books that I’ve started, but got interested in another mid way and have ended up with a pile of unfinished books. So give your self a “Get it done” challenge and use the world cup as your gauge… You have to get things going and score on your GOALS by the time the World Cup hits the finals! Step 3: Get Transactions done faster: No lies, no jokes! I stood in the bank and watched as tellers (male and females) and customers got so engrossed in the match between Germany and South Korea. Not once did any customer complain about the lines moving too slow or being too long. In fact, the emotions rang high and there was a uniformed “joy and pain” match-up as the game progressed. I, the uninterested woman was kindly sent forward by 3 persons in the line because moving forward in the line meant they would be out of the Television’s line of sight. You just can’t argue with this perk of being an uninterested woman in the World Cup crazed zone. P.S. My sister also shared a hilarious story about the dental surgeons in her office and patients who are so caught up in their world cup discussions that the procedures never get started on time! Step 4: Strategically map Traffic Avoidance: Locally, matches are aired three (3) times per day (I learnt this from people who insist on discussing the world cup with me) with most people (my footballzilla friends included) leaving home way earlier to be out of traffic once the early matches air or leaving home way later AFTER the match ends. So key to making the best of this pattern is to know when to venture out as most persons are already at a location of choice watching the match or haven’t ventured out yet while they watch same. Plan around this fact and enjoy this perk my uninterested friend. After all, traffic breaks aren’t always so easy to come by. Step 5: Enjoy the discounts: Marketers love to align their brands with hot ticket items and often, you aren’t required to prove that you are a fan to enjoy the discount. Stroll through your supermarket’s aisles, restaurants, your favourite clothing, household or service vendor and chances are they’ll be offering a “World Cup Special”. Is this something you wanted to bag for a minute? Is the price a great one? then grab the deal! 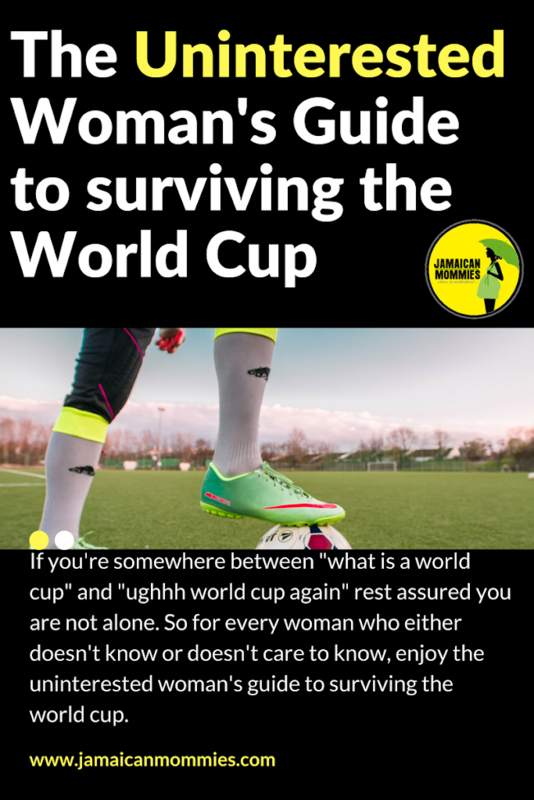 Yet another way the uninterested woman can survive the world cup! Step 6: Celebrate the season: Sooo this may rank kinda, sorta hypocritical BUT you didn’t ask for all this “world cup stuff” to be thrown in your face, so incorporate and then celebrate. Invite your fellow uninterested female friends and have a foodie fest while discussing how you all don’t watch the world cup over wine. Trust and believe, it’s almost like therapy! You can also be inclusive by being the doting spouse to those in your life who are emotionally invested in the World Cup. Layer on some extra food, beers, whatever his drink of choice and serve up a platter so he doesn’t have to take his almost peeled eyes from the TV screen. Sure enough you may be the uninterested world cup woman, but you still want to be an interested and invested partner. Step 7: Embrace the Quality Time: I believe in and wholeheartedly support quality time and the world cup provides a perfect time to enjoy some quality time. This can be had alone, with your kids, parents and generally persons who deserve your active presence in their life. And here’s the extra perk, this is the one time your world cup crazed roommate, partner and friend will not miss your boring uninterested …. so get on out the house already and every one gets to SCORE! Step 8: Watch an actual Match: Ok so this is quite the about turn and I am not entirely sure even as I type this one but EVERYONE swears, I am only an uninterested “world cup woman” because I haven’t watched the matches. Such conversations always end with “Just watch ONE MATCH” and you’ll see. I’ve often deflected this by saying I’ll go to the football viewing parties, more for the vibe than the football and even would have picked up the fever had I been off in Russia, but to date, I don’t want to invest energy in the matches. But if you are uninterested, yet even slightly curious, you can cure the blues by watching an actual match! Worse case scenario, you can reaffirm that this isn’t for you and best case scenario, you may unleash your hidden passion and catch a few matches before the world cup ends! As for me, Please please please stop discussing the world cup with or around me! I’ve been minding my business way too often but still managed to know Germany is out, Neymar plays like a dancer, Messi rebounded from a “messy” situation”, Brazil has a love hate relationship going and teams such as Belgium are worth watching! See! I’m almost corrupted! Previous Previous post: Jamaican Mommies Picnic promises day of play for entire family!